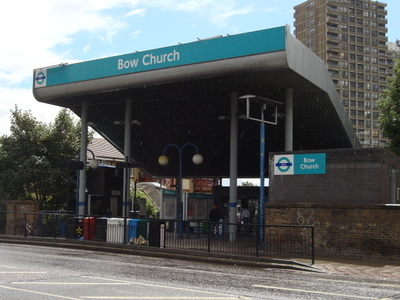 Bow Church station is a station on the Docklands Light Railway (DLR) on Bow Road, in the Bow neighbourhood of east London. The station is located on the DLR's Stratford branch, between Devons Road and Pudding Mill Lane stations and is in Travelcard Zone 2. It is within 300 m walking distance of Bow Road station on London Underground's District and Hammersmith and City lines. Through ticketing is allowed between both stations. 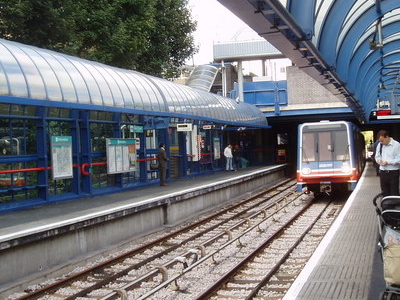 The DLR station opened with the original system on 31 August 1987. The station takes its name from the nearby 14th century Bow Church. There is a crossover south of the station which allows trains from Stratford and Poplar to reverse here. One example of this is when the new platforms at Stratford were being constructed - trains were suspended between Bow Church and Stratford and trains from Poplar terminated here. Here's the our members favorite photos of "Metro Stations near London Borough of Tower Hamlets". 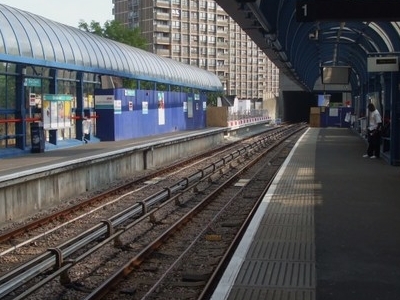 Upload your photo of Bow Church DLR Station!